Johnstown Flood National Memorial youth crew members (l-r) Noah Buchen, Kaitlyn Shiffler, Joshua Metzgar, Jacob Bevan, Tyler King and Michael Gritzler. This summer, local high school and college students are working in five western Pennsylvania national park units—a job that will not only benefit them in their future workplaces, but benefits everyone who visits these iconic sites. A major goal of the NPS Centennial Commemoration in 2016 is to create educational and employment opportunities for the next generation of national park stewards. This year’s crop of students is working on projects that provide training in preservation, interpretation and maintenance activities. The NPS has partnered with the Student Conservation Association (SCA), the Citizens Conservation Corp of West Virginia (CCCWV), and regional universities and high schools to provide this opportunity. In southwestern Pennsylvania, students are working at the Flight 93 National Memorial, Johnstown Flood National Memorial, Fort Necessity National Battlefield, Friendship Hill National Historic Site and the Allegheny Portage Railroad NHS. The CCCWV has a crew of five young people working on landscape projects at Flight 93 National Memorial, and another crew of six is working to rebuild trails at Johnstown Flood National Memorial in partnership with the SCA. Under the NPS Scientific Research Program, biology students from Indiana University of Pennsylvania are helping gather data related to the survival and establishment of trees planted at Flight 93 National Memorial over the last four years. A college intern is presenting interpretive programs, and a high school student is assisting the memorial’s Cultural Resource Manager, Barbara Black, with a variety of curatorial projects. Volunteer Ben Brownfield, a history student at the University of Pittsburgh, working at Fort Necessity. At Fort Necessity National Battlefield, a Fairchance Boy Scout is completing an Eagle Scout project by rebuilding a bridge on Braddock Road, and a crew of six masonry class students from the Fayette Vocational Technical Program will begin building a black powder shed later this summer. 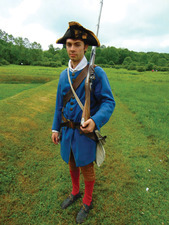 Young men have been trained and are presenting historic weapons programs and soldier talks each day to hundreds of visitors to the battlefield. To learn more about volunteer, internship and employment opportunities for young people at National Park Service sites, email maryellen_snyder@nps.gov or call 724-329-8131.